-An enormous world. Hundreds of quests, dozens of dungeons and enemy fortresses, and multitudes of characters. -Epic storyline. Hunt the assassin Dorikas, while his agents try to trick and waylay you at every turn. -Many unique encounters. Not just mindless hack and slash. Many unusual enemies that will require clever tactics to defeat. -Rich game system with over 50 spells and battle disciplines, many character building options, and powerful secret skills to unlock. -Unique game world. Not just the same old elves and hobbits. 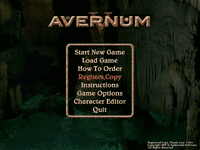 -Experience with previous Avernum games is completely unnecessary to enjoy Avernum 5.